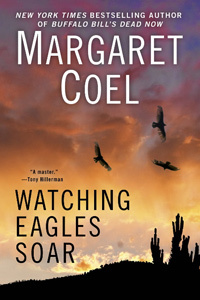 "Margaret Coel is one of Colorado's most versatile writers...with Watching Eagles Soar, she establishes herself as a master of the short story. These stories are little gems for Coel fans... not only well-crafted but rich in details." All ten of the Arapaho Commandments short stories, three other Father John-Vicky short stories, and six additional stories for a total of 19 short stories. One novella, "Molly Brown and Cleopatra's Diamond." Two essays on writing and on writing about the West: "Stories in the World" and "The West of Ghosts." Introduction by Craig Johnson, author of the acclaimed Walt Longmire series (now on A&E TV). Afterward by William Kent Krueger, New York Times bestselling author of Vermilion Drift. Jacket Flap essay by Nancy Pickard, author of many acclaimed novels, including the forthcoming The Scent of Rain and Lightning: A Novel. Back Cover essay by Tony Hillerman. Order online from an independent bookstore via IndieBound, Amazon or Barnes & Noble.